Good news for musical fans who have TVs that were made after 1992! 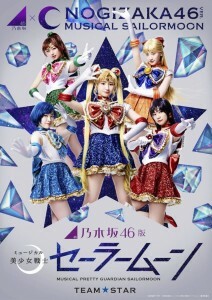 It has been announced on the official Sailor Moon site that the recent Nogizaka46 x Sailor Moon musical will be released not only on low resolution DVD but also on high definition Blu-Ray! This 3 disk set will include two version of the musical, that being both the Team Moon and Team Star versions, as well as bonus features! This is great news given the last 5 musicals, all released long after Blu-Rays and high definition televisions were commonplace, were only released on a low quality 480i DVD. I’ve complained about this time and time again as the past musical releases are really not in keeping with where the rest of the video industry is. This has become particularly frustrating in light of the fact that streaming and digital versions of the musical, uniquely available in Japan, are available in significantly higher resolutions than the DVD releases. I had previously suspected that the reason for the low quality releases was that older style video cameras had been used for the recordings, but this does not appear to be the case. This is particularly useful for North American fans who would normally not be able to play Japanese DVDs but are able to play Japanese Blu-Rays. Japan is in DVD region 2, while North America is in DVD region 1, requiring a region free DVD player to be able to watch a Japanese DVD. When it comes to Blu-Ray discs however a different system based on letters is used and both North America and Japan are part of Blu-Ray region A. I play all of my imported Japanese Blu-Rays on my off the shelf Canadian PlayStation 3 and 4 systems without issue. Keep in mind that these Japanese releases do not have any subtitles so fans will only be able to watch them in Japanese. These releases unfortunately will not be cheap! The Blu-Ray release is 9504 yen, about $84 US, and the DVD at a modest 8424 yen, about $75. There’s certainly a good deal of content at that price but this still seems quite expensive! Bonus features on the third disc will include rehearsal footage, backstage video and more. I certainly hope that this means we will be getting Blu-Ray releases of musicals in the future. While that may be the case this release may also be given more attention due to the fact that it involves members of the band Nogizaka46 and will appeal to a new audience. We don’t have any box art yet but I think a reversible cover with Team Moon and Team Star would be fun. Do you plan on picking up this release? The latest Sailor Moon musical, Nogizaka46 x Sailor Moon musical, began performances in Japan on June 8th! Here’s a look at that musical with photos from the set and other promotional images. 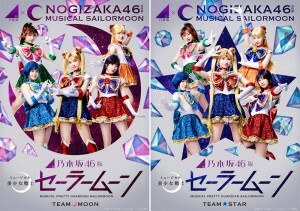 As we’ve mentioned previously this musical features band members of the Japanese all girl pop band Nogizaka46 split into two teams, Team Star and Team Moon, which are in two performances of the musical. The rest of the all female cast is mostly comprised of musical actresses. This musical covers the Dark Kingdom arc of the manga which features Queen Beryl and the Shitennou. We can see from these photos that the story will include the masquerade ball from Act 4 of the manga, Masquerade Dance Party. The musical will continue playing in Tokyo at the Tennōzu Galaxy Theatre until June 24th. It will be performed at the TBS Akasaka ACT Theater September 21st to the 30th. Will any of you be seeing this musical? Keep reading for more promotional images of this musical. 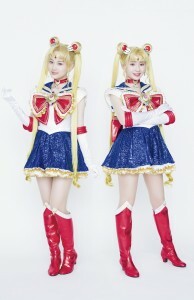 The official Sailor Moon site has been updated with images which shows the entire cast of this summer’s Nogizaka46 x Sailor Moon musical. We previously only got images of the two Sailor Teams, Team Moon and Team Star, which will be played by 10 of the 46 member pop band. 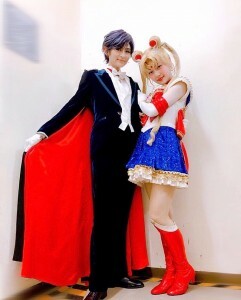 The rest of the cast is composed of musical actresses including Mikako Ishii, who played Sailor Pluto in the last 4 musicals, who will be portraying Tuxedo Mask. Other characters revealed in this image are Naru, Umino, the Shitennou Jadeite, Nephrite, Zosite and Kunzite as well as Queen Beryl and Queen Serenity. 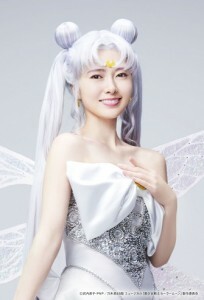 Queen Serenity had not been announced in the previous message I posted about this musical. She will be played by Mai Shiraishi, yet another member of Nogizaka 46. The Nogizaka46 x Sailor Moon musical will play in Tokyo this summer in June and September. It will cover the dark moon story arc and include the cast of Nogizaka46, a 46 member Japanese pop band, spread out over two teams. Some performances will include Team Star and the others will have Team Moon. The rest of the cast will be composed of other musical actors who are not members of the band. Based on the cast information it seems likely the format of the musical will be somewhat like others we’ve seen, covering the Dark Kingdom arc of the manga, which is the first season of the original anime. 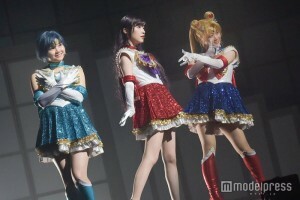 A few weeks ago we got our first look at the Nogizaka46 x Sailor Moon musical. This new musical will be playing in Tokyo this summer first at the Tennōzu Galaxy Theatre June 8th to the 24th and then at the TBS Akasaka ACT Theater September 21st to the 30th. What, you may ask, is this musical all about? 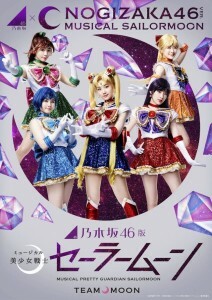 Nogizaka46 is an all female pop band in Japan and this is a Sailor Moon musical featuring members of that band. As we can see from the promo image and the posts on the Sailor Moon official site and musical’s official site, 10 of the band members have formed two Sailor Teams. One is Team Moon and the other is Team Star. 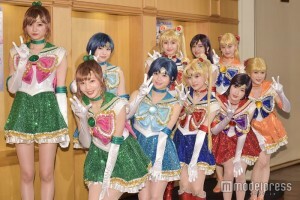 The two teams seem to be identical in costume and appearance, though we can clearly see that the members in those costumes differ from one image to the other. With multiple shows being put on over a fairly short time the two teams are scheduled to perform on different nights. At first I imagined this was to give the other team a break on the off days but since a lot of the other cast of the musicals is only listed once it seems like not everyone is on that schedule. Perhaps this setup is simply meant to vary the performances to feature more of their talent. It remains to be seen if the performances themselves will vary depending on the team performing. Perhaps each team will have an exclusive song to encourage people to see multiple performances! At this point this is only speculation. Here’s a translated cast listing. I’m not good with Japanese names (since Google Translate messes them up) so I had a little help from this Anime News Network article for this list. I attempted to find a relevant link when possible. All members of Nogizaka46 have profiles from the official site and for others I tried to find a profile or social media link. Only the main cast of the Sailor Team will be composed of Nogizaka46 members. The rest of cast of characters are played by various musical stars and dancers, as was the case with other musicals. To me the most interesting casting decision here is that Mikako Ishii, who played Sailor Pluto in the last few musicals, will be playing Tuxedo Mask! It’s well established that Sailor Pluto has an unrequited love for King Endymion in the future! What better way to gain someone’s affection than to literally become them? 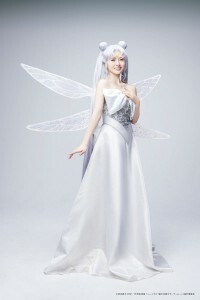 Also returning is Chihiro Ando as Kunzite. She previously played Tiger’s Eye in the Amour Eternal musical. As we see from this an other casting we once again have an all female cast even including the male characters. It seems clear that the story will cover the Dark Kingdom story arc though beyond that it’s hard to get a sense of what the content or structure of the musical will be like. Given the cast and that we have two returning cast members I’m inclined to think that it will be a similar presentation to musicals we have seen in the past. So … which Team are you rooting for? Is that how we’re supposed to be reacting to this? Go Team Star! No way Team Moon is the best! … and so forth.